Two weeks into the field season this April the Conservation Research crew ventured to southern Oregon to monitor a rare lily, Fritillaria gentneri (Gentner’s fritillary). F. gentneri is a listed endangered species by the U.S. Fish and Wildlife Service and the State of Oregon. It is a hybrid of two other species, Fritillaria recurva and Fritillaria affinis, and is endemic to southwestern Oregon and northern California. For more information on F. gentneri characteristics and population dynamics, see the 2011 blog post and 2012 blog post. Flowering Fritillaria gentneri surveyed during April 2013. The monitoring conducted by IAE in partnership with the Medford District Bureau of Land Management (BLM) is part of a multi-year study to determine the status and population dynamics of one of the largest known F. gentneri populations in Oregon, located near Pickett Creek in Josphine County. 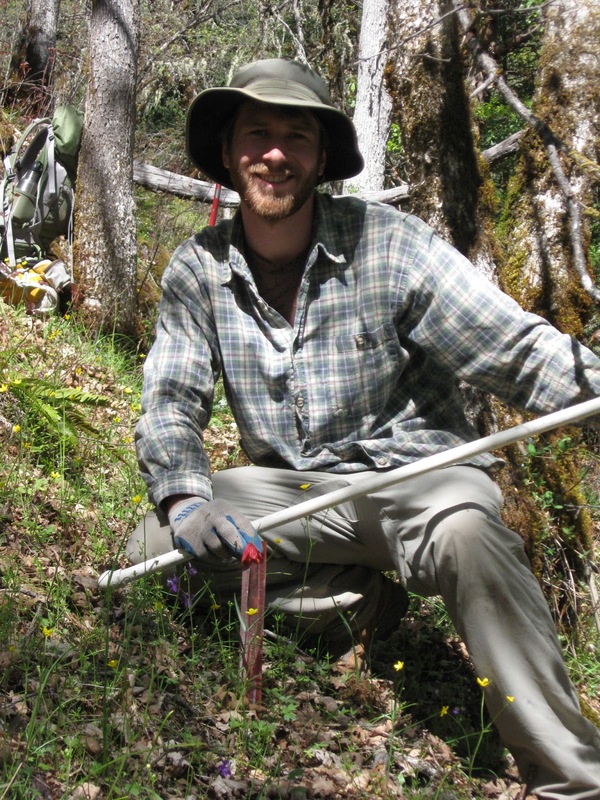 F. gentneri is a vulnerable species, and is impacted by fire suppression, housing and agricultural development, invasive species competition, mining, wildlife grazing, logging, and climatic changes. Over a four-day period in April, the crew collected demographic data on the F. gentneri population that will be used to help evaluate population responses to habitat changes as a result of both natural disturbances and/or future land management. Population monitoring was conducted in two different ways: a flowering plant census of the Pickett Creek population, and density monitoring in established plots. Results of the population monitoring thus far have indicated that there has been variable growth and decline in both number of plants and flowering individuals in all sub-populations. In the 11 years of the study, 2012 had the lowest recorded number of flowering individuals across the entire site, with only 46 individuals compared to the highest at 424 recorded in 2002. The individuals in the density plots have showed a slightly different trend, with a decline in numbers between 2002 and 2006, and increase between 2006 and 2008, and a steady decrease since 2008. While these results are somewhat discouraging, further monitoring is needed to determine if the decreasing trend of flowering individuals has an effect on the population size. An analysis conducted in 2012 also revealed important relationships between climate predictors (seasonal precipitation, minimum temperature, and maximum temperature) and total plants, vegetative plants, and flowering plants. The number of vegetative plants was positively affected by a warmer winter temperature and drier fall conditions. The number of flowering plants was also positively affected by warmer winter temperatures, although was associated with a fall precipitation around 2 inches. These population trends and associated climatic influences are helpful in understanding how F. gentneri may respond to future climate changes. Undetermined factors, acting alone or in conjunction with climate fluctuations, may be causing the recorded decline in the Pickett Creek population. In any case, continued monitoring is imperative to determine the nature of the population dynamics of F. gentneri so that appropriate management actions can be taken. 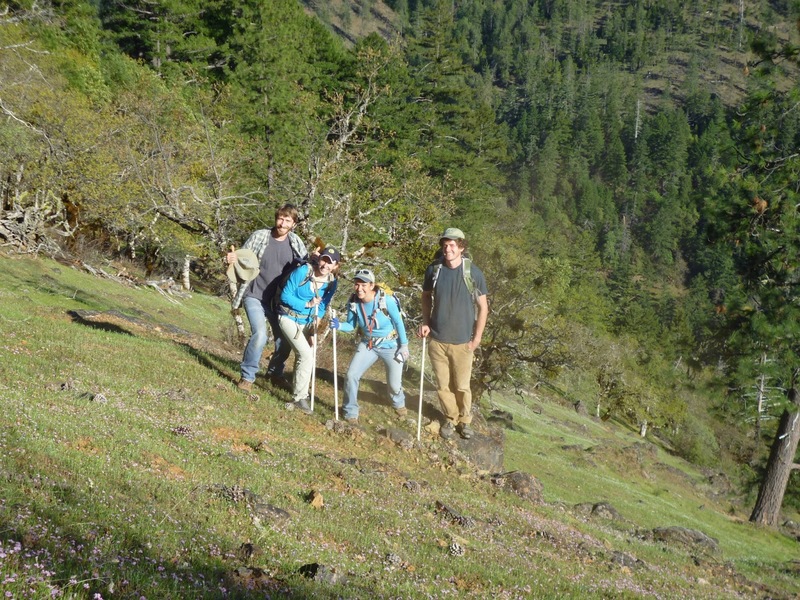 The Conservation Research crew on the steep slopes home to the F. gentneri in Josephine County. From left to right, Andrew Heaston, Charlotte Trowbridge, Kelsey Copes-Gerbitz, and Tobin Weatherson.